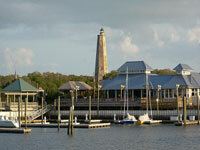 Beautiful Bald Head Island lies off the tip of the Cape Fear peninsula, a serene retreat to a simpler way of life. Stunningly constructed homes to complement the natural surroundings are scattered along the tiny island's beaches, tidal creeks, and maritime forest. Many are available as holiday rentals. Year after year, families board the ferry at Southport for a week or two of relaxation. The ferry is the only way to reach the island, however. Bald Head is also a lovely day trip. There are no cars on the island, so visitors are free to meander along the roads on bicycles or golf carts. Other than the tiny, picturesque harbour, the country club and the Old Baldy Lighthouse, the main attractions are the sun, the sand, and the quiet.